If there was ever an aspect of gaming that was most likely to leave an impression, I’d argue that the #1 answer would be the soundtracks. A game’s music can speak volumes about its tone, world and characters. Some of gaming’s best soundtracks can easily stick with you for years or even a lifetime. That is what makes Theatrhythm Final Fantasy for the 3DS so special for me. Built upon the backbone of nostalgia, Theatrhythm (pronounced Theater Rhythm) cherry-picks a large assortment of songs from all the main numbered Final Fantasy games and builds a rhythm and role-playing hybrid around them. A lot of its charm might be quickly lost on those who’ve steered clear of Final Fantasy, but its legions of fans will find something or everything to love in Theatrhythm. Like most good music games, the story in Theatrhythm is the smallest, least important and sometimes weirdest part of the package. In the never-ending battle between Light and Chaos, a cast of Final Fantasy heroes gather to celebrate music and gather “rhythmia points” until one side is victorious. This mighty dance battle is nothing more than an excuse for familiar faces from Final Fantasys 1 through 13 to march and battle their way through songs, leveling up along the way. It’s certainly odd at first to complete a music stage and find characters gaining a curious amount of experience, but the nature of grinding to increase stats and gain new abilities fits fine here alongside the entertaining and addictive nature of tapping, holding and sliding a stylus. This is as close to chocobo racing as Theatrhythm gets. 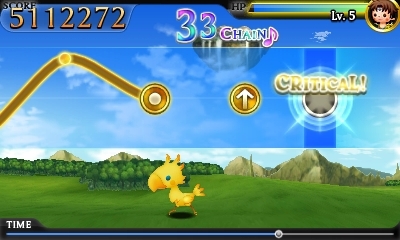 Comprising the meat of Theatrhythm, the music stages are split among three main varieties: Field, Battle and Event. Field stages are lighthearted dashes in search of finding friends and treasure at the end, representing the world map and exploration tunes of Final Fantasy. 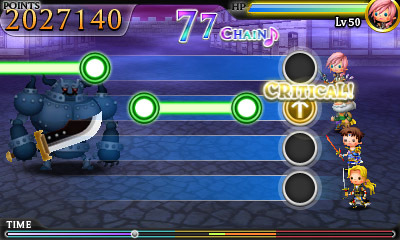 Battle stages find all four party members (represented by their own note track) in combat with enemies and bosses as mighty fighting themes blare. These are a lot more hectic, but the yin-yang feeling of the Field and Battle stages is part of what makes it so hard for me to put Theatrhythm down. Lastly, there are Event stages where the background shows off game footage or cutscenes of the corresponding game. While they’re my least favorite due to the sometimes picky nature of the timing and the distracting nature of the movies, they help Theatrhythm feel more well-rounded than it already is. A music game is only half as good as its music and Theatrhythm easily excels in this area. While not every single song is represented (because there’s tons), a lot of notable and catchy tracks have made it into the portable roster. Headphones might create the ideal conditions for playing, but the tunes are still of great quality through the 3DS’s speakers. The first time I played Final Fantasy VII’s “One Winged Angel”, I was loudly humming along and conducting with my stylus during small breaks. Classic Final Fantasy noises are present here as well, such as the very recognizable post-battle theme after fights. In a compromise to blend all the games together, the graphics are this cutesy style of big heads and beady eyes that just sort of works with the tone of the game. It’s always humorous to start a stage and have your little party line up and spout off some nonsense like, “This time, we fight foolish for evil!” The entire package just glows from all the care put into it for Final Fantasy fans, but I imagine it could prove to be just a little much or confusing for those who aren’t familiar with all its nod to the lore. Gameplay is originally separated into two categories: Series and Challenge. Series allows for predetermined songs from a specific game to be played back to back, bookended by a simple bonus tapping game set to an opening and closing theme. 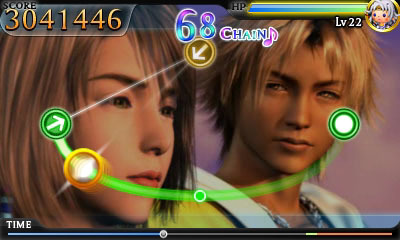 Challenge is similar to a free play mode, allowing for any song to be played at various unlockable difficulties that grant more experience for your party as songs get harder. Rhythmia is awarded at the end of every song based on completion, grade and special performance criteria such as never missing a note. It’s very straight-forward and pretty much a staple of how to set up a fun and accessible music game. Not too long into the rhythmia-gathering process, a third category opens up called the Chaos Shrine. Able to be played solo or locally with other Theatrhythm owners, this section is home to the infamous “dark notes”, randomized two-song collections (a Field and a Battle stage) that range in composition, difficulty and the awards they offer. It’s all quite genius really and I’ve found myself obsessively grinding these notes for experience and the hopes of rare treasures. In relating back to the RPG elements of Theathrhythm, there are one-time items that can help make songs easier, such as potions, scrolls and accessories. There are also crystals to be completed that unlock a number of hidden characters and I really, really want all of those guys. There’s just enough randomization at play here in which songs you’ll play and what bosses you’ll actually encounter at the end that it could take dozens of hours to unlock everything, or even just everything you want. I still amaze myself when I realize I’ve been playing a music game for so many hours in one sitting, plotting out my tactics as if it were a strategy game. Several hours in and this is all routine to me. While I don’t imagine I’ll keep Theatrhythm far from my 3DS, it’s unfortunate that familiar issues with this kind of gaming still linger during every play session. Attempting to play for too long can lead to annoying discomfort. I found myself never wanting to turn on the 3D after initial curiosity, as my intense focus mixed with notes zooming across the screen was bound to give me a headache. This is also the first 3DS game to have DLC for purchase with additional songs increasingly available for $1 each. While it’s a shame these songs weren’t included with the game, at least there’s more to look forward to after S-ranking all the core songs. Theatrhythm is definitely a must for any 3DS owner that can talk about his or her favorite Final Fantasy for days. The memories of playing those games swells to the front of my mind while hearing these songs again, but it’s a gamble otherwise for gamers who aren’t really into Final Fantasy. The stylus-based gameplay and challenging modes are addictive and have me playing for longer than I even imagined, but the discomfort from playing for extended periods of time puts a damper on my rhythm of grinding for loot. There are also trophies and collectable cards to unlock if you’re an insane completionist who drools over that stuff (cause it’s awesome). These quibbles aside, Theatrhythm is a well-deserved love letter to the Final Fantasy series and a real treat for the fans who want a reason to once again let its music blare from their speakers.